Arkansas Native Plant Society (ANPS) awarded one grant and one scholarship, each in the amount of $1,000, to students of Arkansas botany in 2013: Eric Hearth of the University of Arkansas-Fayetteville received a Delzie Demaree Research Grant and Brett (Ty) Murdoch, also of U of A, received an Aileen McWilliam Scholarship. Eric Hearth is pursuing a Ph.D. in forest ecology. His research, under the supervision of Dr. Steven L. Stephenson and Dr. Johnnie Gentry, concerns the distribution, habitat requirements, and ecological relationships of six alien invasive species at Pea Ridge National Military Park in Benton County, namely, garlic mustard (Alliaria petiolata), oriental bittersweet (Celastrus orbiculatus), sericea lespedeza (Lespedeza cuneata), Japanese honeysuckle (Lonicera japonica), Japanese stilt grass (Microstegium vimineum), and multiflora rose (Rosa multiflora). After the initial Pea Ridge survey, the project will be expanded to include Devil’s Den State Park, Hobbs State Park, and selected areas on private property. Northwest Arkansas data will be compared to comparable data collected for the same target species in the central Appalachians. Grant funds will be used to cover travel, equipment, and soil analysis expenses. 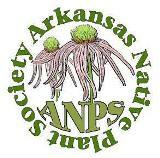 The Arkansas Native Plant society is proud and delighted to support the academic efforts of two such promising students of Arkansas botany as Eric Hearth and Ty Murdoch. We wish them the best of luck in their professional and personal pursuits. Learn more about applying for ANPS Grants and Awards. This entry was posted in Awards and Scholarships and tagged Awards, scholarships. Bookmark the permalink.